When our daughter Cara was nearing middle school age, we were a divided family of 3 -- Steve wanted a public education close to school to expand her social horizon; Elizabeth wanted a private all-girls’ school for Cara to hopefully make transition into adolescence a little easier; Cara wanted to stay at ISTP. We discussed, argued, listened, and talked to different people who have gone before us and chose different paths, and decided to keep Cara at ISTP (although it was against our better judgment at the time). Our biggest hesitation was the fact that she was in the smallest class at school, going into middle school with 2 classmates in the Chinese Program, and a grand total of about twenty 6th graders. Social balance was a huge concern. The fact that Cara was adamant about staying and assuring us that she “would be fine” made it hard for us to think about leaving. What helped us in the decision process was hearing how different parents who kept their children at ISTP for middle school were quite happy with how their children were growing into fine young adolescents. 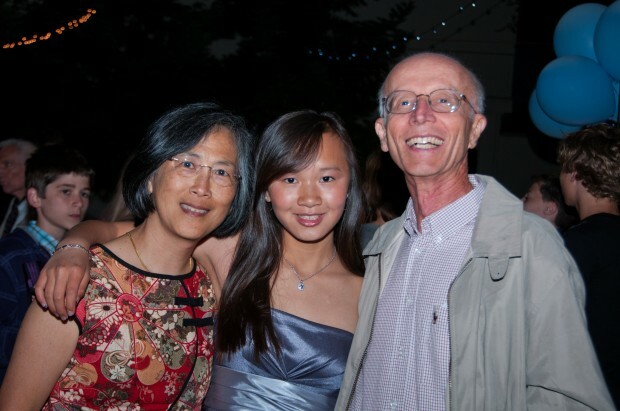 We felt that staying would give Cara the best chance to advance her Chinese proficiency. The small class size in some ways acted as a bonus, as the students get more individual attention. The environment would be safe since the children and parents have known each other since their first day of school, and staying in bilingual immersion was of course still a big draw. We would be telling a lie if we told you that it was all roses in middle school -- Cara had her first ever home detention, for major breaches in conduct. As any parent would, we had doubts. We questioned whether we did the right thing in keeping her at ISTP, but looking back, we know without a doubt that it was a very good education for her. The time and attention she received at ISTP made it a meaningful learning experience. We all agree in hind-sight that the middle school years were extremely good years for her, both academically and socially. ISTP groomed her into a socially confident and intelligent young lady, ready for high school at a high academic level. There was the added bonus of advancing her Chinese, as well as an introduction to French! Although, we were hoping she would choose Spanish (since we live in California), yet she argued for French and we agreed: her reason being was that she could be immersed in the environment where French is all around, and it would be a shame not to take advantage of it. She could always learn Spanish later in high school. We didn’t even think of that possibility -- taking up a fourth language! Ah, of course, we now know it first hand, that if you have at least 2 languages under your belt, then language learning is like second nature. When it came time for high school applications, we differed in opinions, with Steve thinking an all-girls high school, a charter school, or a bilingual high school would be a good fit. Whereas Elizabeth was thinking that Cara was ready to make her own choice. We have heard from different family friends that teenagers will enjoy school if they like where they are at, whereas if they are forced into a situation they dislike, they will sabotage even what the best educators have to offer. With that in mind, we let Cara shadow at high schools of different kinds -- co-ed and all-girls, public and private, large and small. She was clear that she did not want to commute into San Francisco, so CAIS was out of the question. What we asked of her was that she go in with an open mind, and at the end of each visit, jot down the pros and cons of the particular school. We told her that when all the visits were done, she was to sell the school of her choice to us. If it made enough sense, we would honor her choice. Elizabeth can still see her face as fresh as if it was yesterday -- shocked that she would be allowed to entertain the thought of choosing her high school! But why not? We felt strongly that her education at ISTP had truly prepared her for that decision, and trusted that whatever decision she made, it would be fine. When Cara graduated from ISTP, she felt was ready to leave because ISTP gave her the wings to fly, and she could soar where she chose. The 3 years in middle school really bonded the middle-schoolers into their own family. They still keep in touch and see each other when they can, and when they get together, they catch up where they left off. The pre-K and K years prepared Cara for school, the elementary years prepared her for learning, and the middle school years showed the fruits of those years. ISTP is now a place that she will go back to for good memories and with a grateful heart. The transition into high school life has been almost seamless for Cara -- we say almost because Steve and Elizabeth questioned their decision on day 1 of freshman year, when Cara just seemed like she was gobbled up by the over 2,000 students at her new high school. Little did we know that by the end of the week, she would decide to run for class vice-president because a new friend talked her into it. She would tackle another new language (yes, she chose Spanish this time, refusing the easy path of continuing French, taking Spanish I and II in one fell swoop!). She tested into all honors classes, plays organized sports in addition to all of her previous extra-curricular activities, and is thriving. To anyone who wonders if ISTP prepares our children for school life after ISTP, what we have to say is: If your children do well at ISTP, there is no doubt that they will do well at the next level. After all, instead of losing time to academics because of bilingual immersion, they actually are at an advantage. We found that bilingual education actually tapped into areas of gray matter (the brain) that gives them intangible advantages in relation to those students who pass up the opportunity to stay at ISTP for middle school.